There are many elements that can contribute to a successful session, and landing that dream catch you worked so hard for. You can have the best bait, most expensive rods, high-tech alarms, or state of the art fish finders, but none is more important than a sharp hook! Hook choice is a personal preference. Some like short shanks, some long, some wide-gapes, others curved shanks, barbed or barbless just to name a few. Out of all these variations, the single most important thing any hook should have in common is a surgically sharp needle point. There are two main types of hook points: straight and beaked points, each with its unique characteristics. Beaked points have the same effect as the talons of an eagle when hooking flesh – grabbing hold, making a 'grip' and not letting go so easily. An advantage of the beaked point is that the tip of the hook facing inwards does not get blunt easily when fished as a bottom bait over gravel, sand, and other underwater debris. A small disadvantage is that the inward point can sometimes scrape lightly along the flesh, resulting in just missing a hook hold or just hook a catch under the upper flesh of the mouth. But, once it gets in, it stays in. It can counteract, but this is something to discuss in another article. Straight point hooks are, in a sense, the complete opposite to beaked points. This pattern allows for quicker hook holds with less chance of the hook slipping during the initial contact – resulting in deeper, and quicker hook holds. It's ideal when targeting rig-shy or smarter fish, and is typically used on silty or clay bottoms and on rigs that have the hook up in the water such as popups or zig rigs. The major disadvantage of this point is that it can get blunt fairly easy when retrieving it over sand, gravel bottoms or debris. A good habit is to check your hook points before every cast or drop. Even though, the bottom may not be sandy or have gravel or rock; a piece of wood or other debris could potentially blunt the hook point. As I have mentioned, the pattern of your hook is based on personal choice. I have four, sometimes five different types of hook patterns in my tackle box. When I choose a hook type, it’s not based on advertising, brand name or who is using it. For me, the most important factor is how sharp it is, and I mean sticky, nasty sharp! When you are trying to get your hooks out of the packet, it should literally 'stick' to your skin. 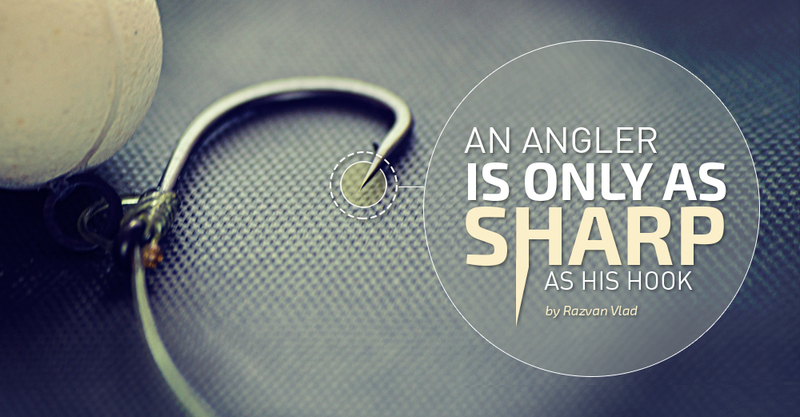 That sharp advantage is what you want when a carp picks up your bait. Good reputable companies have rigid quality control systems, but you should still check the hooks for sharpness, even straight out of the packet. The best way to check the 'stickiness' of the hook's point is the 'nail test'. Simply apply very little pressure on the hook and slide it on your fingernail. The hook should stop immediately. If it slides off your nail, the hook is simply not sharp enough. Now to get to the interesting part. Some companies and anglers advertise that you should change your hook after every catch. If you have a good session, and land 15 to 20 carp over a weekend (at R60 to R70 a packet) it might become expensive. Taking into consideration that it's only the hooks, not the braided line, shrink tubing, rubbers, etc. With a bit of practice, hooks can be sharpened back to their initial state, (or I might add) even better than the original. In my last session, I caught seven carp with the same hook and for the first three catches, my hook didn't need any sharpening. I re-casted every time, only changing the bait. The hook only needed a few strokes with the ceramic rod, and it was restored to its original sharpness again. You won't need a full bench and file set to re-sharpen your hooks. There are some commercial gadgets in the fishing shops with grooves on them, but in my opinion they have limitations such as restricting your angles. Specialised carp fishing companies have acknowledged the need for sharpening tools, and now make specialised sets, designed for hook sharpening such as the Gardner Point Doctor, J.A.G Vice and file sets, etc. I have used my diamond-coated Leatherman Multi-Tool file, and it worked well for me in the beginning, but I only had one problem. The carp fishing hooks have a coating on it, and the file takes that coating away – it has an effect on its hooking abilities, plus the hook can rust. At the moment, I am using a ceramic rod, which is available at specialised knife and cutlery shops. The original idea for the rod was to sharpen serrated knife blades, but its size and shape makes it perfect for fishing hooks. You can use any fine file or ceramic sharpener if it is small enough to use with hooks. The ceramic rod is not as abrasive as the diamond file, so the coating will stay only sharpening the uncoated point. All files will remove the coating, but at the end of the day I prefer a sharp hook to anything else. If I don’t have my ceramic rod on me, I will use my Leatherman’s file. The strokes with the sharpening tool, file or ceramic rod must be done from the curve of the hook towards the point, not against the point. This creates burrs or ridges on the point, and ruins the sharpening. The best method is to start slow. Apply two to three strokes on one side of the hook point, two to three on the other and another two to three over the point. Continually check for sharpness – very gentle pressure is the trick. Always check the overall hook for an opening gape or damage. If you don’t feel comfortable with it, discard it. Before you know it, your hooks will be sticky sharp again. Ready to grab hold of the carp of your dreams. Until next time, stay sharp!